I know a couple of you are done with your Canning Season tops, and several more of you are moving along quite steadily. I hope you send me pictures when you’re done! We’re wrapping up this quilt-along today, and I had hoped to be able to show you how I quilted my quilt, but alas, that is not to be. I don’t have mine quilted yet, but I hope to soon. I’ve been a bit under the weather, and had more important deadlines that I had to attend to when I did feel like working, so I just keep getting further and further behind, as usual. So I’ll save that for another post later on, and we’ll move on to binding. But you could certainly make your binding scrappy, too. I love a good scrappy binding! 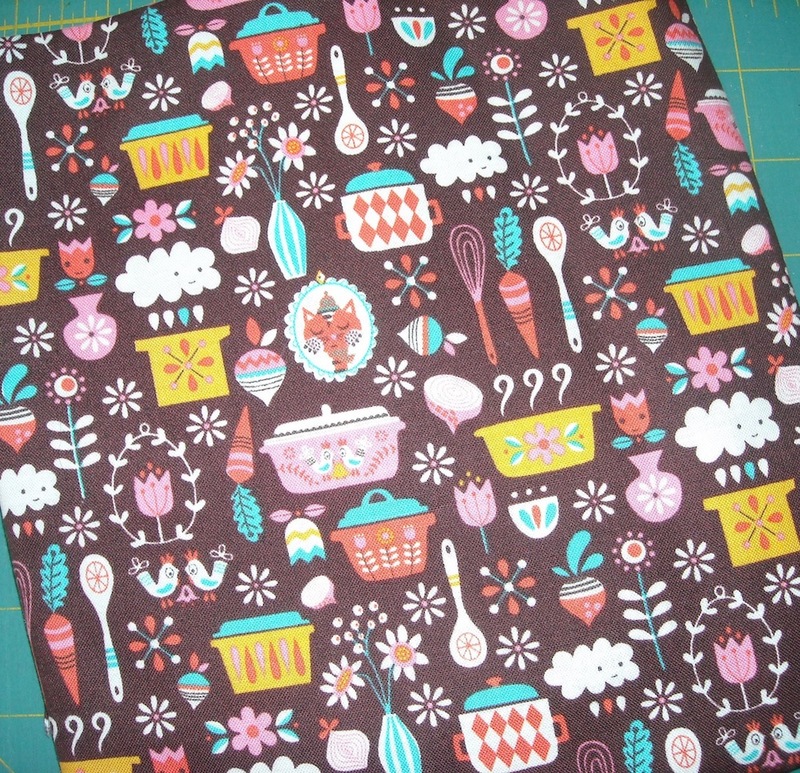 There’s a tutorial here on Making Scrappy Binding. This tutorial will work for making your binding from all one fabric as well, you’ll just be using longer strips. And there’s a tutorial here on Attaching Binding to Your Quilt. And one final tutorial that talks about how to whip the binding down on the back, and how to make and attach a label, if you need help with those things: The Final Touches. If you have any questions about anything we’ve covered, don’t hesitate to ask. And now, to celebrate the end of the Canning Season Quilt-Along, I’m having a give-away! In some of my travels, I stumbled upon a cookbook exactly like the cookbook Hazel used when she was a young wife and mother and homemaker. I can remember standing on a chair at the kitchen table helping her make brownies from the recipe on page 195. I was 5 years old, and I wore a little red and white polka dotted apron she had made me, and I got to stir the batter, and lick the bowl when we were done! 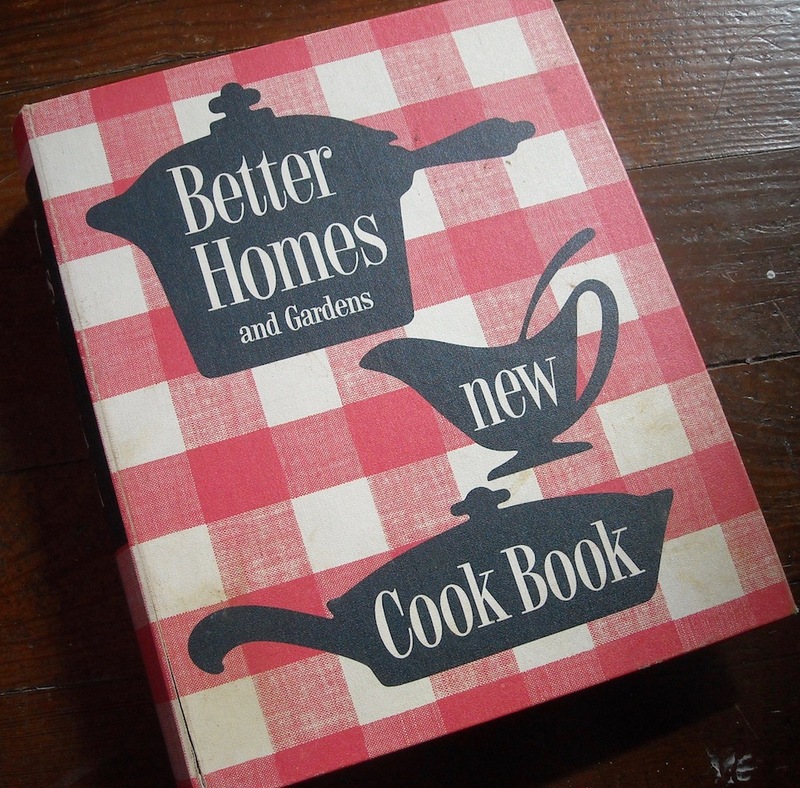 I still have her cookbook and use it sometimes — it’s one of my most treasured possessions. This one is in much better shape than Hazel’s is! If you love old cookbooks, and if you’d like to own a cookbook just like Hazel’s, here’s your chance to win one. Simply leave a comment on this post, and you’ll be entered for a chance to win. It doesn’t matter if you participated in the quilt-along or not — the give-away is open to anyone reading. I’ll draw for a winner on Monday, March 20th. If you’d like to read about my visit to Cotton and Chocolate Quilt Company in California, please visit THIS POST on my main blog. I presented “The Life of Hazel Ilene” program to their Saturday Sampler group. 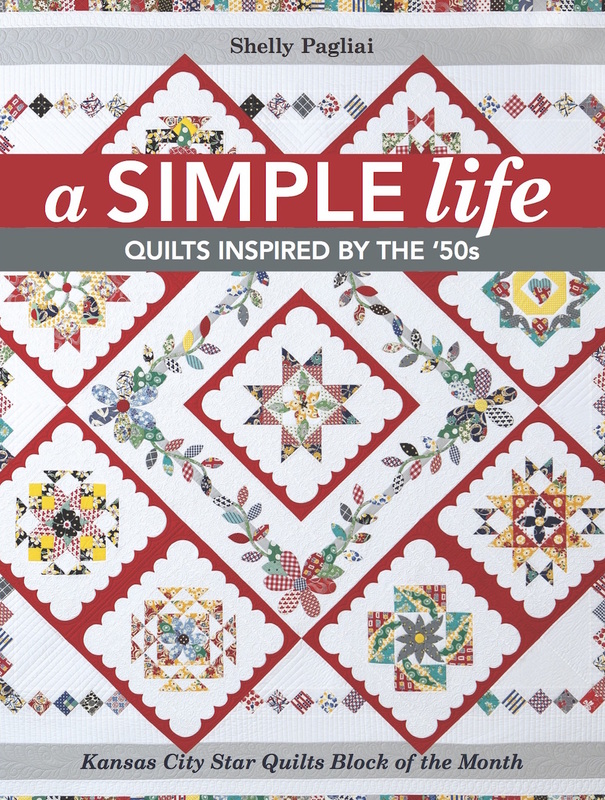 Don’t forget that this coming Saturday, March 18th, is Worldwide Quilting Day — I hope you’ll be quilting! UPDATE: The winner of the cookbook is Mary! Thanks, everyone, for playing along, and stay tuned . . . There are more give-aways coming up! While I thought things might slow down a bit after Quilt Market (the trade show) was over, I was mistaken, and I’ve continued to be busier than a mosquito in a nudist colony. Add to that, I’ve been without my longarm quilting machine for 10 days (and counting), and I still have 15 customer quilts to finish in time for Christmas! I’ll hopefully be back in business by Thursday. If not, I’ll be over here having a major panic attack and meltdown! Due to it being the holiday season and all, and I still didn’t get the Canning Season Quilt-Along started, I’ve decided to put that off until the beginning of next year. Once we’re all done with the holidays, and settling into dealing with the winter months (unless you live somewhere where it’s never winter), I think we’ll all have a bit more time to deal with it, right? So . . . my plan from now until the end of the year is to entertain you with some other stuff: recipes, stories, quilty stuff, and even a couple of give-aways. And we’ll start the Quilt-Along in January sometime (exact date yet to be determined, but stay tuned). 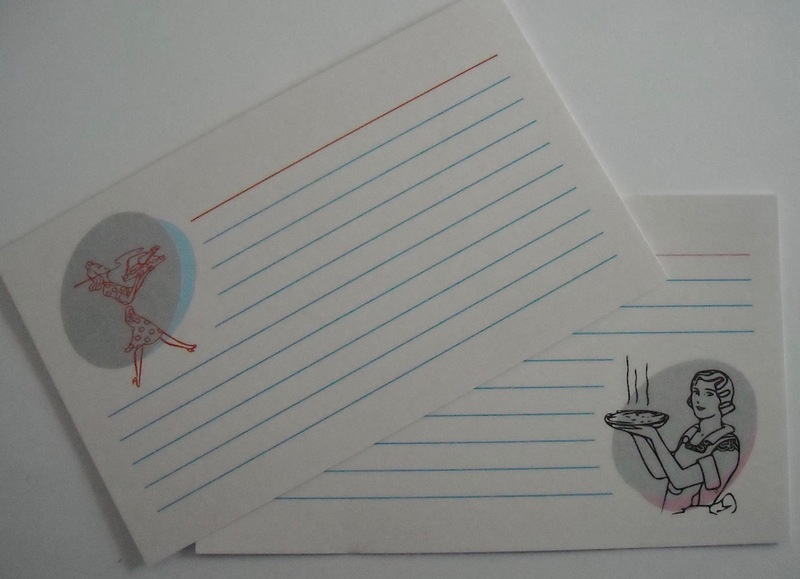 Meanwhile, if you’re looking for some stocking stuffers, I have vintage-style recipe cards and mini-notepads for sale, featuring some artwork from the book. The recipe cards come in sets of 10 (5 of each design), or I can make you a custom set if you need more than 10. They’d be great with a handwritten recipe on them, tucked into a gift of kitchen utensils or with some potholders, or tied to a jar with some of the fixin’s inside. Or fill a vintage recipe box with them! The recipe cards are also available as a printable file, so you can just buy the download and print them yourself on card stock, as many times as you need. 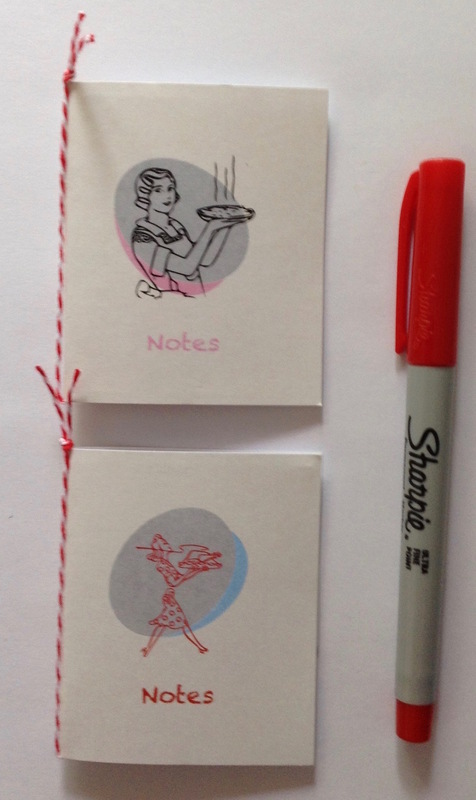 The mini notepads would make great gift tags or stocking stuffers, too. They come as a set of 2 (1 of each design) for just a dollar plus shipping. To purchase, just visit my Etsy shop. And, let’s kick things off right now with a give-away. I won’t go into how it happened, and names are being withheld to protect the guilty, but I have some — ahem — rain-damaged copies of my book. Some of them were beyond salvageable, but a few just got a bit wet on the corner, so they’re still perfectly readable and useable, it’s just that some of the pages are a little warped. If you don’t mind that, then this give-away is for you! I have four copies to give away, and I’ll be sure and autograph them for you. All you have to do to have a chance to win one of them is leave a comment on this post. I’ll draw for four winners on December 15th. And I’ll throw in a set of recipe cards as a bonus! And be sure and check back soon for all the things I have coming up, including info about the upcoming Quilt-Along! There’s a new Quilt-Along starting here on the Hazel’s Diary blog. I wanted to start it on Monday, the 30th, but first of all, I didn’t realize it was a holiday (because I’m never quite sure what day it is), and I didn’t want to start it on a holiday (even tho I’m not sure why that matters) and secondly, My Cowboy spent several days in the hospital last week, so I didn’t get much done in the way of real work, so I’m just not ready yet. And since I’m busy this week getting ready for my guild’s quilt show this Thursday and Friday, I’ve decided to not be too hard on myself, and just get the party started a bit later instead. 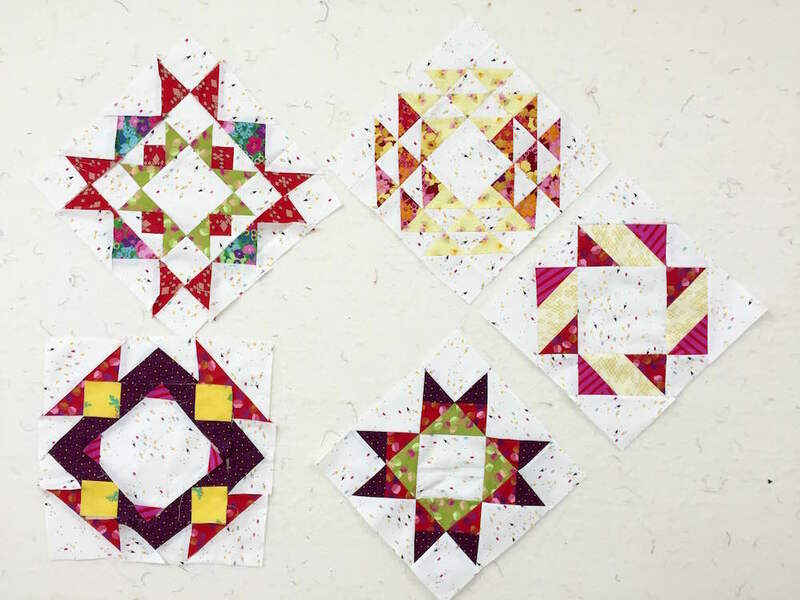 It’s a free Quilt-Along — it’ll be worth waiting for! So while you’re waiting . . . The new Quilt-Along is called Canning Season, and it’s a quilt that didn’t make it into the book, based on one of the blocks from the Hazel’s Diary quilt. You do NOT need the book to join in on the Quilt-Along, so don’t worry about that, but I, of course, think you need the book anyway, just because! Here’s your chance to win a free copy, simply by leaving a comment on this post! Also, to double your chances, you can visit my friend, Victoria, HERE, where she is also having a give-away for a copy of the book! She’s making the blocks for Hazel’s Diary from her new fabric line, Mostly Manor — don’t they look cute in these fabrics? I’ll be back soon with all the info on the Canning Season Quilt-Along, with a picture of the quilt, and the fabric requirements for making the quilt along with me. I can’t wait for you to see it, so check back soon! I’ll draw for a winner of the book on Monday, June 6th. UPDATE: The winner is: Sandy R. Congratulations, Sandy! I hope you love the book. I promised a binding tutorial today, but I’m feelin’ plumb lazy, so I’m moving the binding tutorial to Monday. I hope you don’t mind. It’s sunny out, and the thought of editing lots of pictures isn’t thrilling me too much right now. I figure honesty is the best policy, so I’m just puttin’ that out there! I do, however, want to announce the give-away winner, like I said I would. Thanks to everyone who entered for reading and playing along! Check back Monday for that binding tutorial. Once we’re done with Triangle Salad, I’ll have to let you in on what’s next! Don’t forget — “Today is the day for all girls to grab their husbands”! You can read Hazel’s diary post about that HERE. 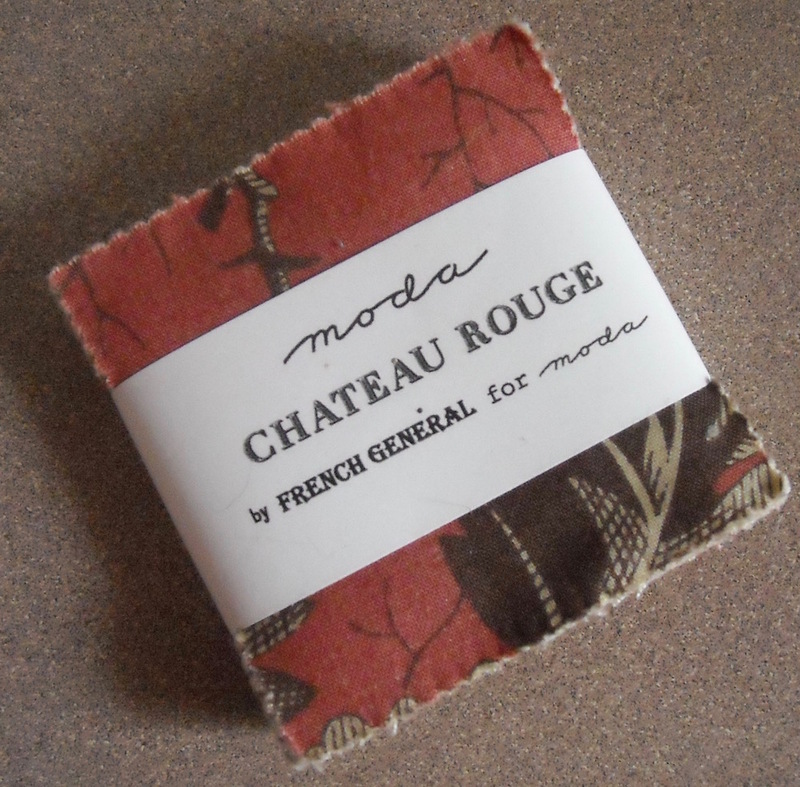 And because it’s Leap Day, and I haven’t hosted a give-away here for awhile, today I’m giving away this little candy pack of French General Chateau Rouge. It’s an older collection, but still a good one. And I’ll throw a couple little extras in the package, too. All you have to do to have a chance to win is leave a comment on this post. I’ll draw for a winner on Friday, the 4th. If you haven’t caught yourself a husband yet, it’s perfectly acceptable for you to do the proposing on this day, and you still have a few hours left! I worked real hard all day & so has Mom. I’m just dead tired. Cleaned out my closet today. Got some of my shorthand tonite. <(in shorthand) I can read it fairly good now.> Guess I’ll go to bed now. Hope I go rite to sleep. She’s finally getting the hang of shorthand. She even wrote some of today’s entry in the diary IN shorthand! Thankfully, I can read shorthand, so I was able to translate it. Today is Hazel’s 1000th diary entry!!! Imagine — faithfully completing this one task for 1000 days in a row — It’s amazing! While she did miss a couple days due to illness, she did go back and fill them in and said that’s what she’d done. I’ve tried keeping a diary since I started this project, and there are gaps everywhere. I can’t even go back and fill in because I can’t remember what I’ve done — Haha! In honor of Hazel’s 1000th entry, I’m having a give-away. I haven’t had one on this blog for quite some time, so your chances of winning are really quite good! I’m giving away a charm pack along with a copy of my charm-pack friendly “Field of Flowers” table runner pattern. 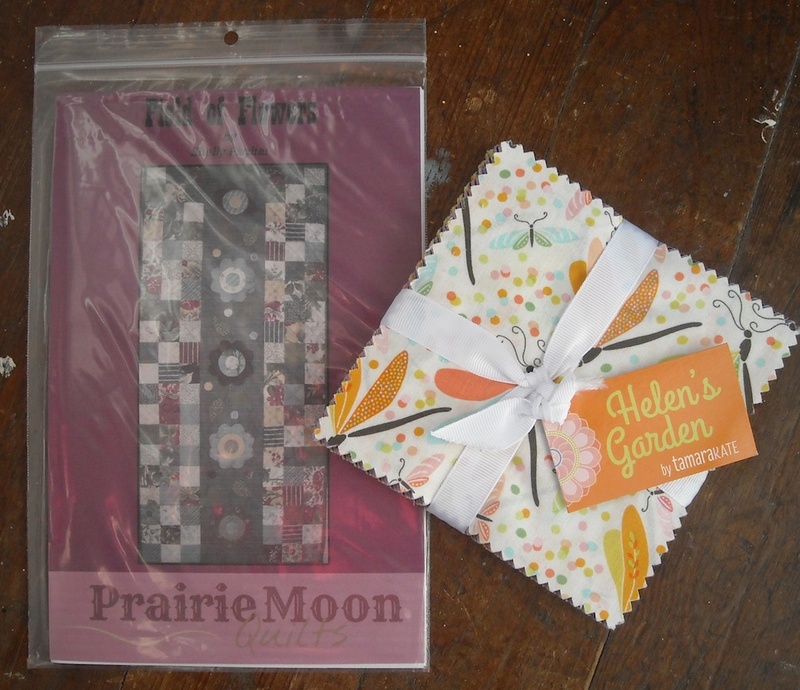 The charm pack is “Helen’s Garden” by TamaraKate for Michael Miller Fabrics. All you’ll need to do is choose a background and some binding fabric to go along with it! Well, and backing and batting. And then there’s the sewing part . . .
To enter to win, all you need to do is leave a comment on this post. I’ll draw for a winner next Wednesday, October 1. The diary entries continue, and Step 2 of the Happy & Scrappy Quilt-Along will be posted next Monday, so be sure to check back in!